Posted June 25, 2015 at 10:04 pm by M&M Mechanical, Inc. & filed under Equipment Tips . With summer officially starting this month, the last thing you need is to run into an unexpected air conditioning problem on a 95-degree day! One of the easiest ways to keep your air conditioner around longer is to do some preventative maintenance on it every month. Although your air conditioner is big and looks like it can take on just about anything, it still needs to be cared for! Cleaning it monthly is one of the best tips we could offer. The dirt and debris that gets caught up in and around your unit can hurt your indoor air quality and damage the unit itself. We recommend checking out your unit every month. But, before you do anything, make sure to turn off the power! Next, you should remove any debris outside the unit. You can do this with a vacuum, or if it’s not too much then you can remove it by hand. After removing the outside debris, you’ll need to clean the inside. You can remove the top grille, and lift the fan out of your unit. Make sure you set it aside carefully as you clean out any dirt inside the fan. After cleaning the fan, keep it set aside but make sure the electrical wires are not in the way. Next you’ll need to take your hose, and spray the fins (the side part of your unit). Make sure the pressure from the hose isn’t too high, but high enough to remove dirt and spray your unit from the inside out. After you’re done, place the fan back on and you’ve successfully cleaned your condenser! In order to keep your unit as clean as possible, we recommend maintaining a two feet clearance around your unit. Be sure to trim any tree branches, flowers and make sure yours and/or your neighbor’s sprinkler systems are not hitting your air conditioning unit. Most of the preventative maintenance you can do on your air conditioner is recommended to be done by a professional, but we wanted to offer some tips that you can do at home, for free! Posted June 9, 2015 at 9:28 pm by M&M Mechanical, Inc. & filed under M&M Mechanical . 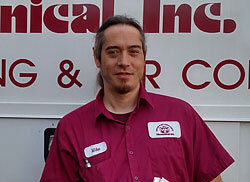 Mike is our Lead Installer and “Go to Guy” for specialized custom jobs that require extreme knowledge and perfection. His workmanship is second to none. We’ve been counting on Mike to come through for us for 20 years, and we know that we can always count on him! M&M Mechanical wishes to thank Mike for his complete dedication to making M&M the professional and honest company it is today. Thank you for your service, Mike! Posted April 17, 2015 at 4:10 pm by M&M Mechanical, Inc. & filed under General Tips . A clean duct and HVAC system can increase indoor air quality, create a more comfortable interior environment, save energy, and extend the life of your system. In order to guarantee that your home is getting the best quality air for your home, duct cleaning is a must. We offer full duct cleaning for your HVAC system – coils, coil drain pans, plenums, air filters, ducts, fans, vents and registers. If you are finding insects or rodents in the entrance of your ducts. If you’ve noticed mold in your ducts. If you’ve noticed large amount of dust or debris in and around your ducts. If you just bought a new home. If you have a lot of pets. If you or your family have allergies year-round. If you’ve recently completed a remodeling project. If you get your HVAC system maintained properly, a duct cleaning should be required every 3-7 years. If you haven’t touched your system is many years and run into problems monthly, this could mean a duct cleaning is required more often. We’ve had many customers come to us with complaints of unexpected allergy-like symptoms, and, after a full duct cleaning, they’ve noticed an improvement. Unfortunately, indoor air pollution can be worse for you than outdoor pollution. People spend the majority of their day inside their homes and buildings, so clean indoor air with low levels of dust and the right level of humidity is incredibly important for day-to-day health and comfort. A duct cleaning is the best way to improve the quality of the air in your home or workplace. Posted March 26, 2015 at 7:57 pm by M&M Mechanical, Inc. & filed under Seasonal Tips . Change the Air Filter: We suggest checking your air filters more often than you might think! Changing and cleaning your filters helps circulate heating or air conditioning in your home much more efficiently. Inspect Caulking & Insulation: Just as you did before these harsh winter months, make sure to inspect the installation and caulking around windows and doors. This will ensure that the air will continue to circulate within your home instead of escaping outdoors! Turn Your System On: It may seem silly to test out your system before the heat really sets in, but in case of any issues, you should test your system! That way, you’ll be able to resolve any issues before there’s an emergency. Install A Programmable Thermostat: Installing a programmable thermostat allows you to set the temperature controls even when you’re not in your home! This way you can maintain a comfortable temperature in your home. Consulting one of our HVAC professionals at M&M Mechanical could help you get ahead of any potential problems in the upcoming spring months! 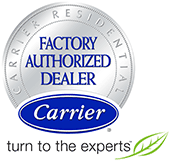 Don’t forget to schedule your installation, walk-through or maintenance appointment today! Posted March 10, 2015 at 9:48 pm by M&M Mechanical, Inc. & filed under Equipment Tips . HVAC filters are the part of your HVAC system that requires maintenance regularly – and that we all tend to forget about the most. Filters that are ignored can hurt your HVAC system’s efficiency, which can increase your energy bill and also lead to more unexpected repairs. If you have pets, smokers or allergy-sufferers in your family, your filter is at a higher risk to get dirtier, quicker. Whether you have disposable or permanent, they need checking every month. If you’re changing your filter on your own and have to go out a buy a new one – bring your old one with you in case you’re not sure what size to get! If you’re cleaning the filter instead of replacing it, make sure you always turn off your system before starting the cleaning process. Disposable filters made of cardboard are much cheaper than permanent ones made of metal or fiberglass, but also have to be replaced more often and require more attention. In the long run, the metal or fiberglass filters may be more cost effective. You should vacuum, soak and sanitize the filters during your cleaning process. After that, drain them so that they are completely dry before re-installing. The MERV (Minimum Efficiency Report Value) is important when choosing what type of filter works best for your HVAC system. The higher the MERV value, the better the filter! Cleaning and/or changing your filters regularly helps your system run better, but this is only one small part of your HVAC system. To ensure that you are getting everything out of your system, you should have the whole thing checked at least twice every year. If you’re having trouble cleaning your filter, or are ready for a full system tune-up, give us a call!